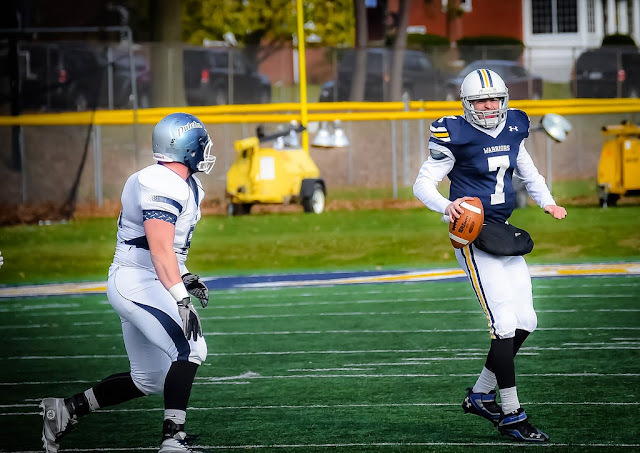 WILLIAMSPORT, Pa. – Senior Tyler Jenny (Glasgow, Pa./Glendale) used one of the gutsiest performances in the history of the Lycoming College football program to lead the team to a come-from-behind overtime win over Lebanon Valley to earn USA College Football’s Impact Player of the Week award, the website announced on Wednesday morning, Nov. 11. Playing with an injured knee in the fourth quarter and overtime, the tough-as-nails quarterback led two game-tying drives and the game-winning drive to keep answering the bell against the Dutchmen in the 30-29 win. In regulation, he lofted a 20-yard beautiful touch pass with 1:18 left to tie the game at 23. Then he threw a touchdown pass on the first play of overtime to lift the Warriors to the win. In all, Jenny tossed for a career-high 411 yards, the third-most in school history and four touchdowns. After returning to the game in the fourth quarter, Jenny threw for 161 yards and three touchdowns and completed 8-of-12 passing. For the season, Jenny has completed 173-of-272 passes for 2,279 yards and 22 touchdowns. He has been intercepted just six times and his 156.26 passer efficiency rating is the third-highest in program history. In three years as the team's starter, Jenny has posted a 22-7 (.759) record. His 63.0 career completion percentage and 147.5 pass efficiency rating are both school records. He is just six yards shy of becoming the third quarterback in program history to pass for 6,000 in a career, while his 56 touchdowns are fourth in program history and his 486 completions are third-best in program annals, four shy of Keith Cadden's mark of 490 set from 1994-96.